Readers have probably coupled books with hot drinks since the first bible came off the Gutenberg press in the 1450’s. The two things just go together. For a long time, drinks were prohibited from libraries, and that was a fussy mistake. Rules like that simply ask for deliberate disobedience, which is why patrons would check the books out, take them home, and return them full of coffee rings and dessert crumbs. Libraries were asking for it. The situation these days is a little different. Many libraries now have their own coffee shops, and some even allow food. If you’re not impressed, that’s probably because you’ve been pretending your local Starbucks is a library, and you’re used to the smell of coffee and those disgusting breakfast sandwiches wafting through the air while you update Facebook and pretend to work. Wake up! Free Wi-Fi and expensive coffee does not a library make. If you are thoroughly confused, then think about this: I am often asked if libraries and librarians are needed anymore, now that we have the Internet. Hopefully, I have demonstrated that librarians still have a job to do, but what about the physical library? Does it still have a role, now that so many resources are online and Wi-Fi is so readily available? 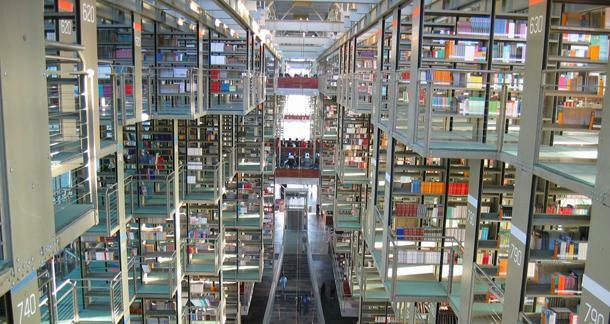 Do libraries offer a compelling reason to use them anymore? Why would you choose a library over Starbucks? Since the name of this column is “Library Love,” the obvious answer is “because we love libraries!” Unfortunately, that answer is lame. No one is going to use a library long-term just because it reminds them of childhood story time or junior high make-out sessions in the stacks; nostalgia only goes so far. Let’s consider some other factors. A lot of people say that a dollar spent is a vote cast. It definitely sends the message, “keep the supply coming!” In the case of Starbucks, it may also be sending the message, “let’s line the pockets of Howard Shultz with gold!” According to Hoovers (as well as Forbes), the CEO of Starbucks made $16M in 2011. That fact may not concern us, but let’s think about the library equivalent. In the case of libraries, a resource used (be it space, eBooks, research help, etc.) is a vote cast. No one’s pockets are lined with gold, because libraries are nonprofits. Your “vote” is indicating to city, county, and (in the case of academic libraries) university administrators that the collections, services, and spaces offered by libraries are important and necessary to you, and that they should continue to be funded. When those “votes” disappear, so do the libraries, as well as everything they offered their communities. And libraries don’t reopen easily, if at all; a former library on my campus is now a really nice restaurant. If you have no idea what resources and services are available at your local library, you’re missing out! In addition to the usual (research help, reader’s advisory, pajama story time), my local library’s calendar includes a classic horror film series, a beginning Mandarin course, introductory computer classes, and a host of career services-- like job networking events, and one-on-one career and business counseling. And I almost forgot to mention that they also offer Wi-Fi. Since I’ve already paid for these “free” services with my tax dollars, I don’t have to buy something first in order to enjoy them. If you spend a lot of your time in commercial spaces, it’s easy to forget that alternatives exist. Think about all of the great buildings that have ever inspired you – were they commercial or were they civic? Museums, cathedrals, government buildings, and libraries are all reliable sites in which the architecture betrays the importance of the work that happens there. These structures are built to last for generations and meant to elevate the mind for the purposes of art, spirituality, governance, and learning. Great spaces engage you in ways that mundane spaces cannot. In my profession, we call this library as place. Even in a time in which more and more resources are available online, libraries continue to invest in dynamic, forward-looking architecture. Just run a Google image search for “library architecture,” or “modern library architecture,” and you’ll see what I mean: library as place is still embraced as a fundamental value by librarians and those we serve. Every time a new library opens (or a massive renovation is completed), record numbers flock to use the space. Why? For the DVD collection? Here’s my theory: the proliferation of "shoppes" and "towne centers" may have satisfied a need (or collective desire) for designer sunglasses, fusion restaurants, and relaxing places to drink coffee, but commercial spaces will never satisfy all of the needs that a library can address. A great library has the potential to serve as a community hub, where resources and services intersect with work, learning, and culture. A space designed to facilitate such interactions while making the patron feel something – inspired, creative, curious – cannot be replicated commercially. Ultimately, I’m not saying don’t visit Starbucks – I certainly do. The corporation has over 10,000 cafes scattered around the country, and they’re hard to ignore, especially if you’re a coffee addict like me. However, there are 123,000 libraries in our nation, 16,000 of which are public libraries. Once they’re on your radar, they should also be hard to ignore. If your workplace is mobile, why not take advantage of everything a library has to offer? You might show up for the Wi-Fi and stay for something more.